State legislatures have passed legislation requiring districts/charters to use multiple types of data to evaluate educator effectiveness. Over the past few years, ATI has worked with its many district and charter partners to create and implement a robust system that aids administrators in completing this task easily and efficiently. In many states, these new laws require districts/charters to observe teachers, consider student growth data, and look at student performance levels on state tests when evaluating teachers. Although all of these diverse pieces of information are important when looking at instructional effectiveness, the question arises as to how to statistically determine one aggregated performance classification from multiple measures providing scores that vary in terms of score type, score scale, and score range. ATI’s Score Compiler allows districts to select a wide variety of measures to use for educator effectiveness, place these scores from these measures on a common scale using defensible well-established statistical procedures, and then weight each measure as desired. In addition, the total number of points, performance classification nomenclature, and cut points are configured based on district/charter specifications. Finally, the Instructional Effectiveness view of the Galileo Dashboard provides easy access for administrators to performance classifications for reporting to superintendents and state representatives as needed. 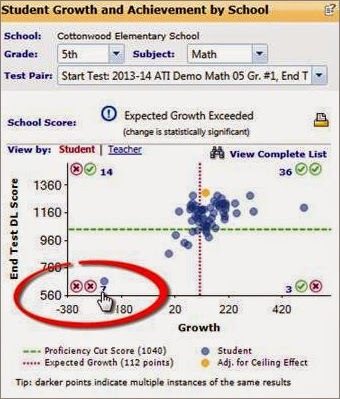 ATI’s Score Compiler allows for easy compilation of student performance data and teacher performance data. The types of measures that districts/charters can include in the Score Compiler are limitless. One of the most commonly used measures among ATI district/charter partners includes Categorical Growth scores at both the teacher and the school level. These scores provide data about whether a student has exceeded, maintained, or failed to maintain expected growth based on an ATI pre/posttest during an instructional-time period. Although Categorical Growth scores are the most popular, other types of scores based on any Galileo benchmark or formative assessment may also be incorporated into the Score Compiler. The Score Compiler also allows for external test scores (e.g., state tests, DIBELS, AP Scores) to be uploaded into Galileo. Measures such as mean scores, median scores, and percentages of students can be automatically calculated and compiled. On the teacher performance side, Educational Management Services Coordinators enter customized district teacher evaluation rubrics into Galileo. 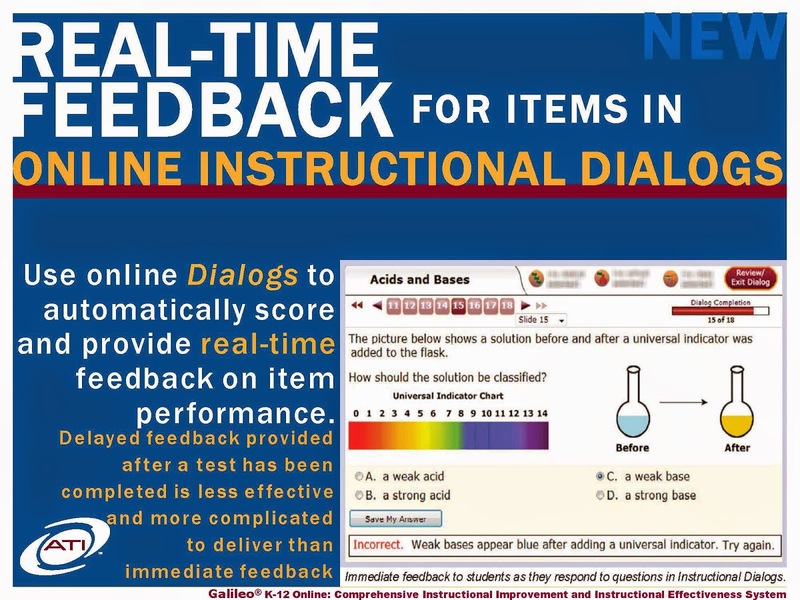 District administrators can then use the online rubrics to input teacher observation scores and the results of these observations can be included in the Score Compiler. In addition, any other types of scores may be manually added to the Score Compiler. For example, districts/charters have included scores based on parent surveys, teacher surveys, attendance, and Student Learning Objectives (SLOs). As summer season kicks into high gear, ATI staff preparations for the new school year are well under way. In the area of data importation, the focus during school year transition is on new classes, rosters, and accommodating all staff changes a district may undertake between school years. Be sure to include all the required information in your import. Optional information is not required in the Galileo database, but failure to include this information may adversely affect future report filtering. Note: Any omitted optional data can be imported at any time throughout the school year, either as part of GDI or as a separate process – contact ATI for more information. Providing “shell” data with class structures and teachers as soon as they are entered into your SIS this summer will provide opportunity to perform thorough review of class alignment, course codes, and teacher assignments. This will speed the processing of files containing student enrollment in the fall. Participation in Instructional Effectiveness (IE) initiatives with ATI may require roster for all responsible teachers to be imported. Participation in No-Evaluation Importation (NEI), the process of preparing for frequent updates to rosters and data within Galileo K-12 Online, requires three successive no-change imports at the beginning of each school year. ATI also hosted a recent Learning on Demand session: Data Importation for Existing Users-The New School Year (31 minutes). The recording can be found in the Galileo Forum. To access the Galileo Forum, click on the Forum link in Galileo K-12 Online. Once you log in to the forum, access the “Resource Library” category and then proceed to the “Learning On-Demand Recordings” sub-forum. Click the link for “Data Management” and you’ll find the recording. Galileo Dashboard views offer quick access to the most commonly used reports designed for teachers and administrators in one convenient place. One of the most used reports in Galileo is the Student Growth and Achievement (SGA) report. Accessible to all user levels, the SGA report cross-classifies student achievement with student growth yielding new and useful information to guide instruction. When the desired tests and subject are selected, the student data is displayed graphically in quadrants. The information in each quadrant has unique significance for instruction. Effective instruction for students in one quadrant will differ from instruction designed for students in another quadrant. The SGA report provides the ability to create intervention groups from the individual student counts in each quadrant. The Intervention group allows teachers and other district staff to group students with similar growth and achievement needs for instructional and assessment purposes. The count of students in each quadrant run in the SGA report hyperlinks to the ability to create intervention groups comprised of students in that selected quadrant. Student growth is measured by the difference between achievement at time one and time two. Time one is represented by an initial assessment, such as a pre-test. Time two is represented by a second assessment or a post assessment. To learn more about the Student Growth and Achievement report, contact your Field Services Coordinator.